K & D Welding/Fab, LLC provides high-quality welding services, specializing in custom plate fabrication, new and rebuilt metal products and maintenance and repair welding. We are your trusted, local welding professionals! We provide timely service and competitive pricing to meet your job needs. 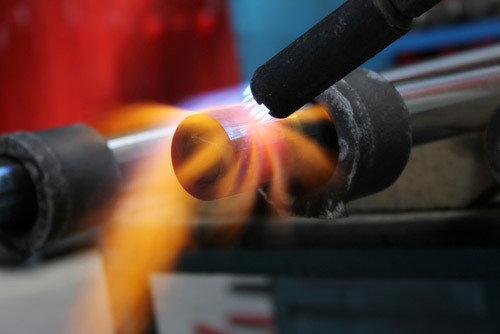 K & D Welding/Fab, LLC brings nearly three decades of experience to every project. Locally-owned and -operated, we offer all of our clients a first-class customer experience to ensure your 100% satisfaction. 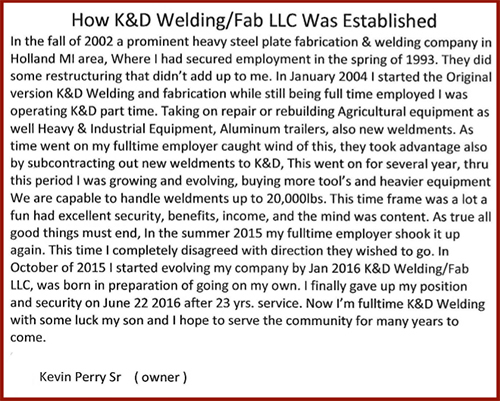 This combination of knowledge and superior service has made K & D Welding/Fab, LLC the leader in welding in Dorr, MI. Whether it’s custom or standard fabrications, maintenance, repair or rebuilt products, our customers know they can count on us for reliable and affordable service. We listen to your needs, then work hard to meet them. It’s why we consistently exceed customer expectations and enjoy an established reputation for quality service. We are locally owned and operated, established in 2004. We offer nearly 30 years of experience in the industry. We are American Welding Society (AWS) D11 Certified and fully insured. We specialize in industrial and agricultural needs. 90% of our work is custom free-hand fabrication. For custom fabrication that stands the test of time, contact your trusted professional welders at K & D Welding/Fab, LLC today.